Built in 1935 and long respected as a symbol of Latvia's independence, Freedom Monument in Riga has seen the country's occupation by both the Soviets and the Nazis and Latvia's subsequent liberation. Standing more than 40 metres tall, with a woman, affectionately known as Milda, on top holding three stars, the monument is to this day, the centrepiece of many Latvian political and cultural events. On November 18, 1918, the Republic of Latvia was proclaimed. That was Latvia's birthday. Birthdays are wonderful events if we all participate. Join us to celebrate! Everything is prepared and ready to celebrate the centenary of the Latvian State. We asked 98 foreign people to share ones private and particular association - what is Latvia for them? Latvia is a keystone of Northern Europe's Baltic Seas region. On the world map Latvia can be found in North-Eastern Europe, on the east coast of the Baltic Sea. A country with a language, culture and attitude all its own, yet with a national identity shaped by the surrounding dynamic Northern European region and woven through with diverse historical influences. A country that survived two world wars and 50 years behind the Iron Curtain, in 2011 entered its third decade of renewed independence. In 2004 it became a member of NATO and the European Union. In December 2007 it became a member of the Schengen area. On January 1, 2014 the country adopted the euro currency and in July 2016 became a member of the OECD. Latvia is in Northern Europe and borders Estonia, Russia, Belarus, and Lithuania. It is situated on a trading crossroads and has long since served as a bridge between Western Europe and Russia. The famous 'route of the Vikings to the Greeks' mentioned in ancient chronicles stretched from Scandinavia through Latvian territory along the Daugava River to the ancient Russian and Byzantine Empire. The population of Latvia today is around 2.0 million. The ethnic composition is around 62% Latvian, 28% Russian, 3.4% Belarusian, 2.3% Ukrainian, 2.2% Polish and 1.5% Lithuanian. The diverse ethnic mix of the population of Latvia is largely the result of massive post-war immigration, which resulted in a decline in the share of ethnic Latvians from 77% in 1935 to around 62% today. There are more than 1.65 million ethnic Latvians in the world, and approximately 450,000 live outside Latvia. Latvians can be found in the USA, the UK, Australia, Canada, Germany, as well as Brazil, Lithuania, Sweden, Estonia, Ireland and Russia. In fact, there is hardly a country in the world where Latvians have not made their presence felt. Even if you have not yet visited Latvia, you stand a good chance of meeting a Latvian somewhere else. Almost 95,000 people of Latvian descent live in the U.S. today, the largest concentration being in the North-East and Mid-West States. As one of 200 major languages in the world (spoken by more than 1 million people), the Latvian language is also one of the oldest. Latvian belongs to the Indo-European language family, and together with Lithuanian, forms the Baltic language group, related to, but separate from the Slavic and Germanic language groups. The total number of Latvian speakers in the world exceeds 2 million, and for 1.5 million of them it is their native language. The Latvian flag is one of the oldest in the world. Written records of the red-white-red Latvian flag have existed since the second half of the 13th century. The distinctive dark red color of the Latvian flag is sometimes referred to, by the rest of the world, as 'Latvian red'. The forefathers of the Latvian people first arrived in the Baltic region in 2000 BC. In the 9th century AD the ancient Balts began to establish specific tribal realms. The territory of modern Latvia was inhabited by four major Baltic tribal cultures - the Couronians, Latgallians, Selonians and Semigallians, and a Finno-Ugric tribe, the Livs. In the 13th century Latvia was invaded by armed Germanic crusaders, who founded Riga and established control over the indigenous people and territory. 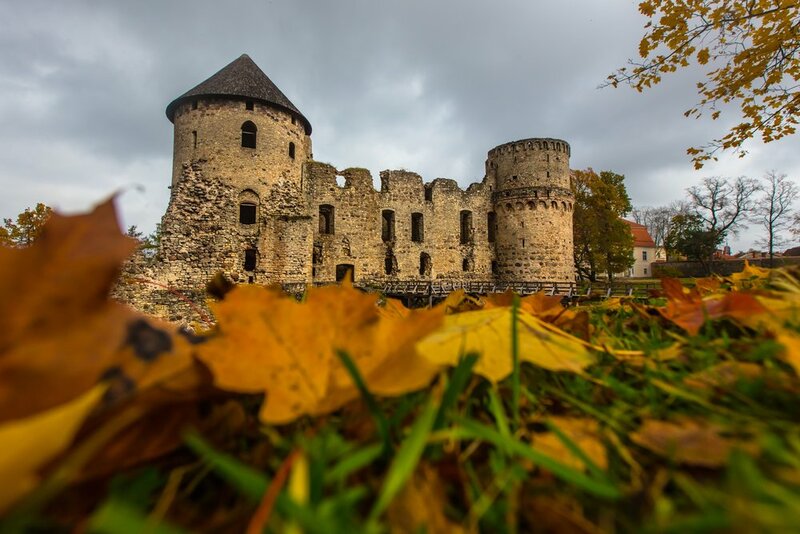 Over the ensuing centuries, traders and invaders from Germany, Poland, Sweden and Russia established a presence in Latvia, alongside the local Latvian and Liv inhabitants. In the late 19th century Latvia was politically ruled by Russia and economically controlled by Baltic Germans, yet the majority of Latvia's inhabitants were ethnic Latvians and descendants of the original Baltic and Liv tribes. In November 1918, the Latvian people finally established the Latvian state. During WW II Latvia suffered three invasions and occupations. As many as 120,000 Latvians were deported to Soviet concentration camps in Siberia, 140,000 fled to the West, and thousands more perished or disappeared in the conflict. During the Soviet occupation between 1940 and 1991, hundreds of thousands of Soviets of various nationalities were brought into Latvia, reducing the indigenous ethnic Latvian population to nearly 50%. In 1990, the people of Latvia elected a majority of pro-independence deputies to what was then the ruling Soviet parliamentary body, the Supreme Council of Latvia. The new Supreme Council voted to begin the political process of removing Soviet rule and restoring full independence to Latvia. On 21 August 1991, following the collapse of the Soviet Union, the Latvian Supreme Council adopted a resolution for the full restoration of Latvian independence. The Supreme Council was abolished in late 1992, paving way for the first post-independence Latvian parliament, elected on 5-6 June 1993. The new 5th Saeima, continuing the link with the pre-war parliaments of Latvia, elected Guntis Ulmanis the new President of the Republic of Latvia in 1993. Re-elected in 1996, President Ulmanis was followed by Dr. Vaira Vike-Freiberga. Dr. Vike-Freiberga was elected as President in 1999 and re-elected for a second term in 2003. Dr. Valdia Zalters was President from July 2007 to July 2011 followed by Mr. Andris Berzins, who served from July 2011 to July 2015. Mr. Raimonds Vejonis is the current President of Latvia and assumed office on July 8, 2015 as Latvia's 5th President since regaining independence in 1990 and the 9th President since Latvia proclaimed its independence in November 1918. His current term runs till July 2019. For more information about the President of Latvia, please visit www.president.lv. In Latvia's parliamentary democracy, the President appoints a Prime Minister (who must be approved by the Saeima) and signs laws into power. Mr. Krišjānis Kariņš is the current Prime Minister, taking office on January 23, 2019 after the latest elections for the 13th Saeima that took place in October 2018. For more information about the current Latvian government please visit www.mk.gov.lv. For more information about the history of Latvia, please visit www.latvia.eu. Latvia's foreign policy, like its economic policy, has been one of the success stories of the post Cold War era. Latvia is a member of the UN and gained EU and NATO membership in 2004. Special ties have always existed with the United States, which never recognized the legitimacy of Soviet rule in Latvia following WW II. Latvia's first diplomatic mission in the US was established in 1922 and continued to function in Washington D.C. throughout the 50 years of Soviet occupation. Full diplomatic ties were renewed in 1991 when President George H.W. Bush was President. Subsequently, Presidents Bill Clinton and George W. Bush have sought an active partnership with Latvia, with President Clinton visiting Riga in 1994 with Mrs Hillary Rodham Clinton., and President George W. Bush in 2005 and in 2006. Secretary of State Hilary Clinton visited Riga in June 2012 and in November 2013 UN Secretary General Ban Ki-moon visited Riga. In the first half of 2015, Latvia hosted the Presidency of the EU. On April 3, 2018, the President of Latvia, together with the Presidents of Estonia and Lithuania met with U.S. President Donald Trump as part of the Baltic centenary celebrations in Washington. D.C..
Latvia's commitment to global cooperation is reflected in its membership of the UN, EU, WTO, World Bank, IMF, WHO, OECD, Schengen area, and other international bodies. Latvia has actively participated in NATO and EU-led international operations, including Macedonia, Bosnia-Herzogovina, Kosvo, and Afghanistan. Latvian soldiers are currently deployed with the ISAF in Afganistan. Latvia is steadily expanding its ties with all regions of the global community. It has 35 diplomatic missions around the world, with embassies and trade offices in most countries. In the first half of 2015, Latvia hosted the Presidency of the European Union and in July 2016 joined the OECD. After regaining its independence in 1991, Latvia has evolved into one of the most dynamic and fastest growing economies in all of Europe. Today, the economy’s main economic sectors are services (74%), comprising logistics, IT, financial services and trade; and manufacturing (15%), comprising wood, metal, pharmaceuticals, chemicals and food. Exports represent today around 15% of GDP (with wood products being the largest contributor, comprising 19%), with the largest markets being Europe (65%), UK (6%), Russia (6%), CIS (4%). Over the period 1995-2007 Latvia's economy grew by an average of 7.6% per annum. This phenomenal success was in part due to rapid price and trade liberalization, extensive small and large-scale privatization and rapid financial sector reform since the early 1990's. Assisted by exuberant foreign investor inflows and in hindsight loose domestic fiscal policy, during 2005-2007 Latvia was the fastest growing economy in Europe. In 2008-2009 as the effects of the global economic slowdown started to impact and the ensuing global credit crisis hit hard. Latvia’s growth pace slowed sharply - not a surprising result given the open nature of the Latvian economy and its dependence on global trade and financial flows. The economy experienced a very sharp recession (GDP fell -17.7%) before recovering in the first half of 2010. Latvia’s recovery from this very sharp slump has been noted internationally as a textbook success-story. Latvia's decision to tighten its fiscal belt, cut wages, and not devalue its currency (which was then pegged to the euro) was questioned by many – but in the end was a successful recipe, putting the economy back onto a solid growth path that is is benefiting from today. In the past two years, the Latvian economy recorded one of the strongest growth rates in the EU, driven by strong manufacturing output, retail trade and construction activity. In 2017 GDP grew by 4.6% and a further 4.8% in 2018. Key drivers of this ongoing strong performance in 2018 was normalization of disbursement of EU funds, a stronger U.S. economy, and better prospects in Europe and selected emerging markets. Although Latvian exporters have expanded to new markets, Europe remains the key destination for Latvian exports. 2019’s pace of economic growth is forecast to remain solid (around 3%), in line with the expected slower pace of European and global business activity. If Europe holds up, Latvia will benefit accordingly. Looking back, the sharp recession experienced in 2008-2010 has helped Latvia to consolidate its economy resulting in more sensible economic and financial management by both the private and public sector in Latvia in the years to come. Moves by international credit ratings agencies like Standard & Poor’s (A-), Moody’s (A3) and Fitch (A-) to continue to upgrade Latvia’s credit rating is confirmation that a sustainable turnaround is now underway and there is international recognition of the major economic reforms Latvia has undertaken since 2009. On January 1, 2014, Latvia became the 18th member state to join the euro currency block. Previously its currency was the lats, which was pegged to the euro from 1994. In July 2016, Latvia became a member of the OECD. For more detailed and up to date information on the Latvian economy, please visit the Latvian State Treasury website here. With its prime location as a transit hub for east-west trade, Latvia has become one of the most favorable destinations for foreign investment in the 'New Europe'. Sectors attracting investors include manufacturing, forestry and woodworking, metal processing and engineering, textiles, chemicals, pharmaceuticals, logistics and transit, construction and real estate, and information technology.For more information about business investment opportunities in Latvia visit the Latvian Investment and Development Agency (LIAA) website here. LIAA now has a dedicated representative here in the United States. The European Union accounts for close to 80% of Latvia's total trade. Latvia's major trading partners include Germany, Sweden, the UK, Poland, Russia and its Baltic neighbors Estonia and Lithuania. Latvia has one of the lowest tax burdens in Europe: corporate tax rate at a flat 20% and individual tax rates of 20/23/31.4%. For more information please visit the Finance Ministry website. After Latvia regained its independence in 1991, the Latvian currency, the lat, was one of the most stable currencies in Europe. After joining the EU, in 2005 Latvia joined the European Monetary Union, and the lat was pegged to the euro (1 LVL = 0.702804 EUR). On January 1, 2014, Latvia joined the euro currency group. The Bank of Latvia is independent from the government in Latvia and is now part of the ECB and Euro-system. It's major goal is price stability, so as to help foster a strong, growth-orientated economy. For further information about Latvian monetary policy, the economy, and the euro please visit the Bank of Latvia website. RIX - Riga's International Airport - is rapidly emerging as a new strategic hub for international tourist, business and related travel in the Baltic Sea region, and is now one of the top 5 fastest growing airports in Europe. 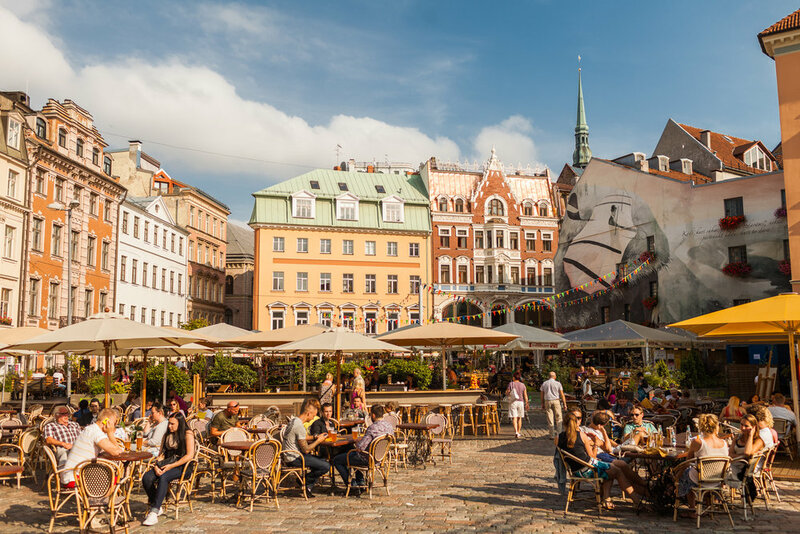 Latvia can be reached from the U.S. via convenient connections through most European capital cities, including Helsinki, Copenhagen, Stockholm, Amsterdam, Frankfurt, Paris, Zurich, Vienna, as well as via London. Riga airport is served by 20 airlines and offers flights to 80 destinations in Europe and beyond during the summer peak season and to about 60 destinations during the winter season. A record 7.0 million passengers traveled through Riga's airport in 2018. Riga Airport is also home to Latvia's national carrier, Air Baltic, serving close to 60 destinations from Riga to Scandinavia, Western and Southern Europe, the UK and Ireland, the Mid-East and Central Asia. For further information please visit the Riga Airport website. One hundred years ago Riga was known as the 'Paris of the North'. 800 years young, Riga is now called 'The Second City that Never Sleeps', and the 'Hottest City in the North'. As it moves into the 21st century, Riga is blossoming as a creative center for the arts once again. Local and visiting art exhibits and the opera, theater and ballet compete with nightclubs and discos that rock with jazz, blues and the latest electronic fusions of hip hop and dance music. For more information about Riga, please visit the Riga City tourism website (or see the Videos in the Resources section of this website). In 2014 Riga was designated European Capital of Culture. Riga is architecturally considered to be the Jugendstil capital of the world. Latvian architects are responsible for designing over 60% of the distinctive Art Nouveau style buildings made famous in the early 1900's. Nearly one-third of Latvia's population (650,000) lives in the capital Riga. Riga, the oldest existing medieval city, was founded in 1201. Riga has been included in UNESCO's list of the world's most important cultural and natural sites. November 18 is Latvia's National Holiday. Latvia's independence was proclaimed in Riga on November 18, 1918. Following WW II, Latvia was occupied by the Soviet Union between June 17, 1940 and May 4, 1990. In 2018 Latvia will celebrate its centenary since becoming a republic. 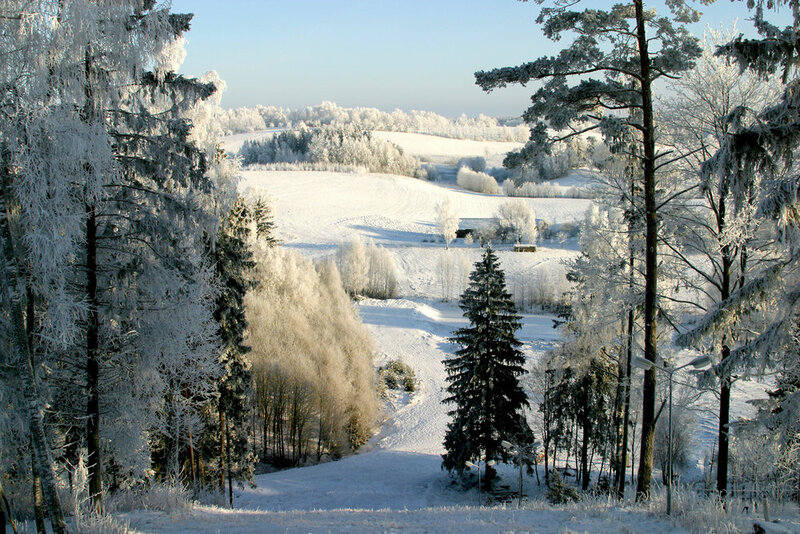 Latvia's landscape is marked by lowland plains, rolling hills, thousands of rivers and lakes. Forests cover 44 percent of the territory, and most of the countryside is less than 100 meters above sea level. World famous Latvian performers like Elina Garanca, Maija Kovaleska, Marina Rebeka, Kristine Opolais, Aleksandrs Antonenko, Mariss Jansons, Gidons Kramers have all performed at New York's Carnegie Hall and the Lincoln Centre and regularly return there each season. Latvian-born Mikhail Baryshnikov has established his own performing arts center here in NYC (BAC). Grammy Award winning conductor Andris Nelsons and the Boston Symphony Orchestra regularly perform at Carnegie Hall. In 2005 and 2006 the winner of the NYC Marathon was Jelena Prokopcuka, also from Latvia, returning in 2014 to finish in 4th position. In 2015, Latvian basketball star Kristaps Porzingis joined the NY Knicks and was voted into the NBA All Star team in 2018 - the first Latvian ever to win this award.